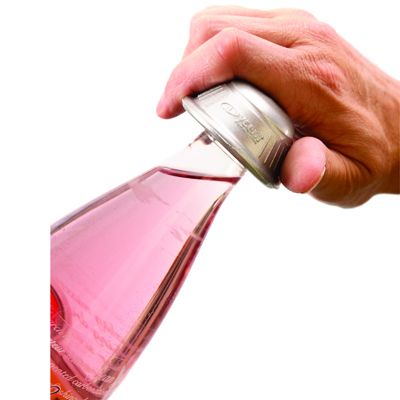 Dycem® Jar and Bottle Openers are dome shaped to fit comfortably into the palm of the hand. 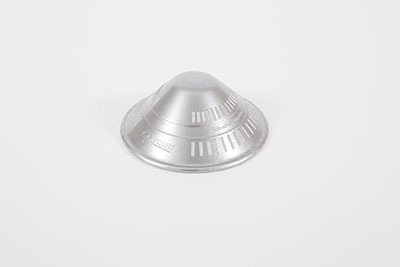 Fits all lid sizes and ensures a good seal when closing. 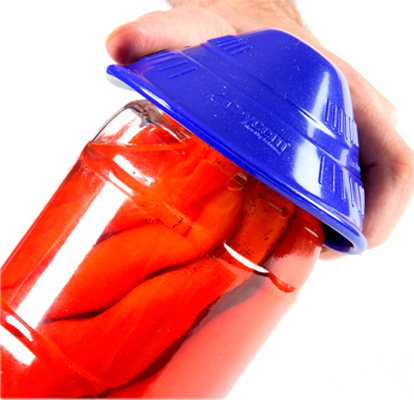 The Jar and Bottle openers' are also ideal for people with a weak grip, decreased sensation in their hands and upper extremity weakness. Dycem® openers can help with opening; Medicine bottles/Rx bottles, Jars, Door knobs, Cabinet handles, Faucets, Drinks bottles. 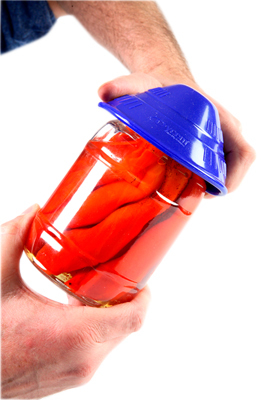 Dycem® Jar Openers are dome shaped to fit comfortably into the palm of the hand. Fits all lid sizes and ensures a good seal when closing. 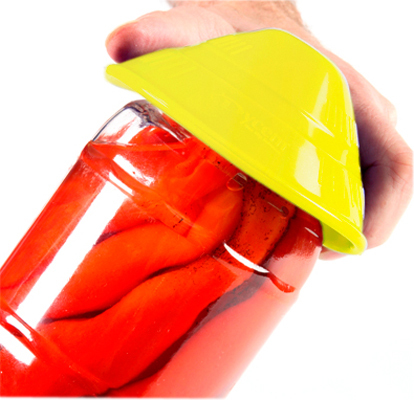 The Jar and Bottle openers' are also ideal for people with a weak grip, decreased sensation in their hands and upper extremity weakness. Dycem® openers can help with opening; Medicine bottles/Rx bottles, Jars, Door knobs, Cabinet handles, Faucets, Drinks bottles. Dimensions: 4.5" x .25" x 4.5"
Dimensions: 4.5" x 0.25" x 4.5"
Dycem® Bottle Openers are dome shaped to fit comfortably into the palm of the hand. Added unique grip bars around the opener maximize grip. The bottle openers' malleable design guarantees that it will fit on any sized bottle lid. Use to open and tighten stubborn bottle lids including: Ketchup bottles, Fizzy drinks bottle tops, Medicine bottles/ RX bottles. 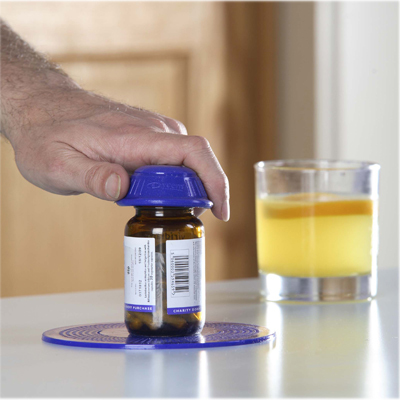 Its superb grip even opens 'push down and twist' pill bottles and allows a tight grip on small cupboard doors providing you with an outstanding gripping solution. 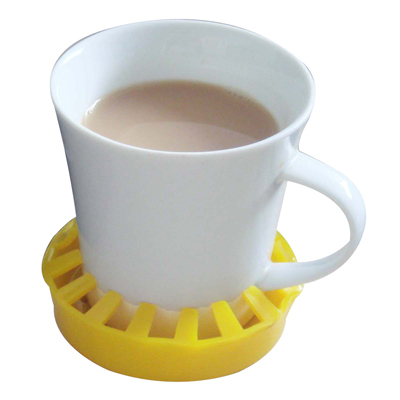 Dimensions: 5" x 0.2" x 5"
Dycem® non-slip self-adhesive cup holder fits snugly onto bottom of a mug or tumbler. 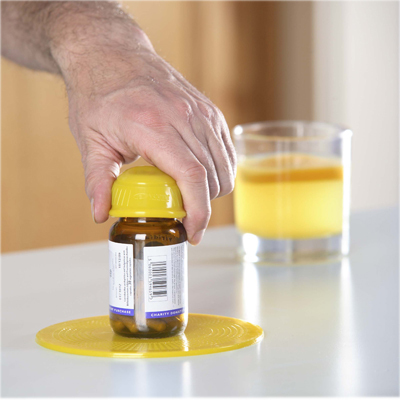 The non-slip base helps to prevent movement and spillage. 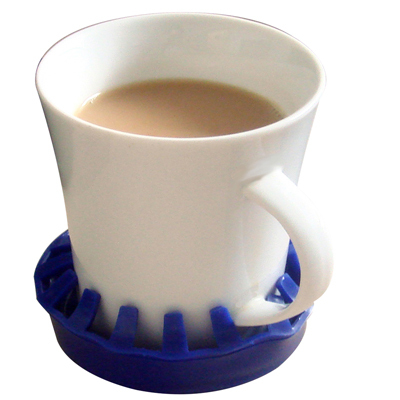 It can be used with hot drinks. Material is reusable and easy to clean. Latex free. Dimensions: 3.5" x .5" x 3.5"